Manama: Ferrari president Sergio Marchionne said he and his team now feel “completely confident” of mounting a championship challenge following Sebastian Vettel’s victory in Sunday’s Bahrain Grand Prix. Marchionne believes Ferrari will now be “at the forefront of this world championship”, he said following the four-time champion’s well-judged drive to triumph. “It is, of course, hugely satisfying to be back on the top step of the podium with Seb,” said Marchionne. “More importantly, however, we are now completely confident that our victory in Melbourne (the season-opener) wasn’t just a one-off and that we will be at the forefront of this world championship until the last. “We finally have a competitive car to count on and it is important to recognise the speed with which we implemented the developments demanded for each new race. The president’s statement endorsed Ferrari’s optimism after a weekend that saw defending champions Mercedes under serious pressure for the first time in four years. Vettel said his win was built on a crucial early move when he split the two Mercedes at the start of the race, moving from third on the grid to second. 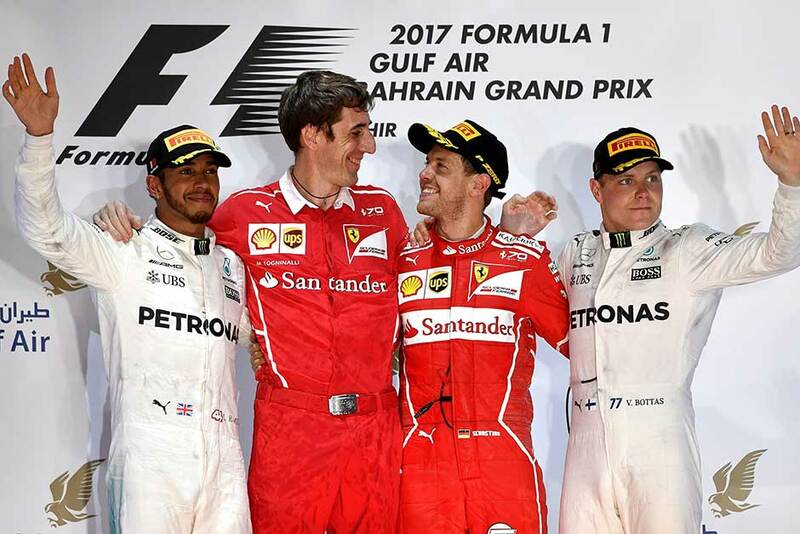 It was Vettel’s second win of the season, his third in Bahrain and the 44th of his career. “It was crucial for us to get between them and not to let them get in front and pull away and do their thing,” said Vettel. “We all had more or less the same start and Lewis stuck with Valtteri (Bottas) so I could take a risk under braking and get the move done. “After a couple of laps, I was on Valtteri’s gearbox for the first stint and not falling back too much. It was a good start — our pace was key today to win. Hamilton was handed a five-second penalty for a pit lane infringement which ultimately cost him dearly. “I tried to control the gap — he was very fast when he came out, I expected him to be quicker but not that quick,” added Vettel. He added that he was disappointed with Ferrari’s showing in qualifying, but delighted with the team recovery on Sunday. Mercedes team chief Toto Wolff says he is considering introducing team orders in a bid to halt Ferrari’s momentum in this year’s world championship. Wolff admitted that it may be difficult for Mercedes to continue to allow their drivers total freedom — and may ask new boy Valtteri Bottas to take the role of a ‘number two’ driver.